Since its inception in 2004, September is annually observed as National Preparedness Month. What does that mean for you? 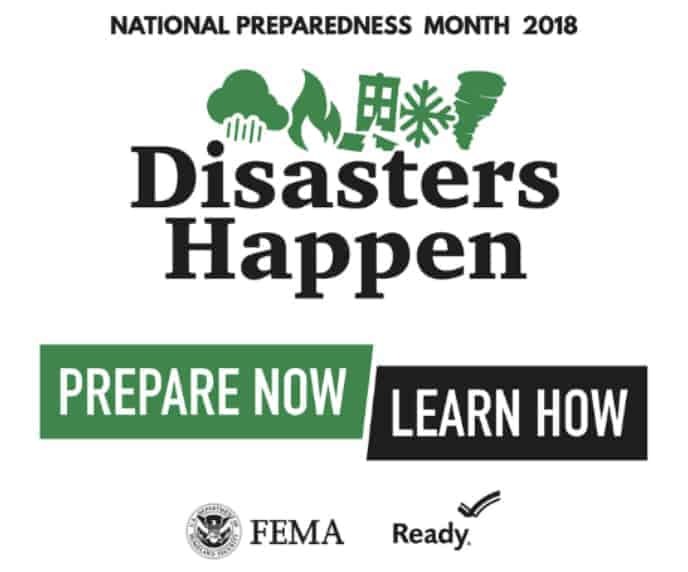 September is an opportunity to remind everyone to prepare now for when a disaster happens. In today’s world, it’s not if a disaster happens, it’s when. And it is our responsibility to be prepared. With a wealth of resources and information available at www.ready.gov/September you can easily assemble appropriate information for a family plan. Review the plan with family members so everyone knows and understands expectations and roles. Sign up for local alerts and warnings in your area to keep you updated and abreast of any disasters that might be occurring. Once the family plan is in place, practice it with family members so they can be comfortable should the occasion arise. That family plan should also include what to do should you need to evacuate the residence. Things like available exit routes and turning off utilities should be considered when developing this plan. Are utilities easy to reach? How difficult are they to turn off? Once it is in place, practice it so you know exactly what to do when time is of the essence. Part of planning for a disaster can also include learning life-saving skills like CPR and first aid. These courses are available online through the American Heart Association with the check-off of skills done at a local certifying agency. Check with your local resources and sign up. You never know when those skills will be needed. Preparation also includes reviewing insurance coverage. Insurance is there to help alleviate whatever financial burden may happen with a disaster. It’s not a bad idea to review your coverage and adjust whatever might be necessary to ensure minimal financial devastation should the disaster occur. As part of National Preparedness Month, VPC is conducting a large-scale exercise in northeast Indiana across 19 providers in 11 counties. Read more about the September 10 exercise. Are you signed up for the latest from Vantage Point? Join the email list to be notified of last-minute openings, upcoming training events, and helpful tips for workers and employers.